Bugsy Hammerton scores tying goal for Saints in final seconds. 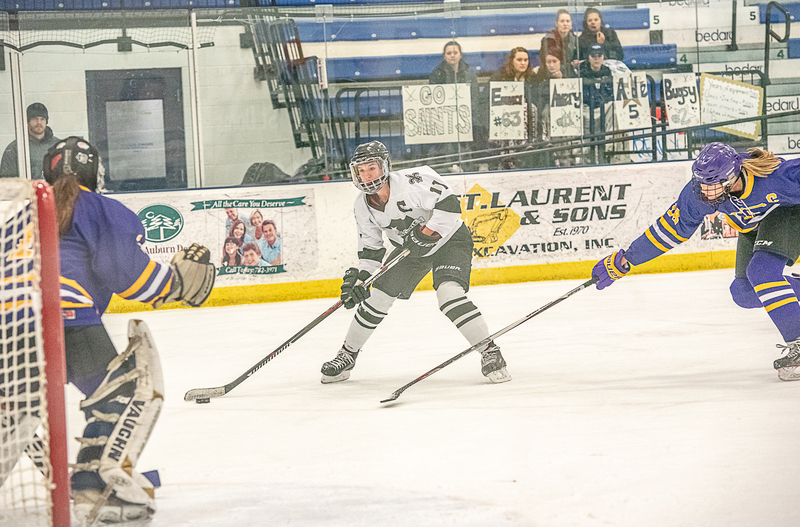 AUBURN — Bugsy Hammerton didn’t play the first time St. Dominic Academy and Cheverus/Kennebunk met this season in girls’ hockey, but the senior made the most of her ice time in the rematch. 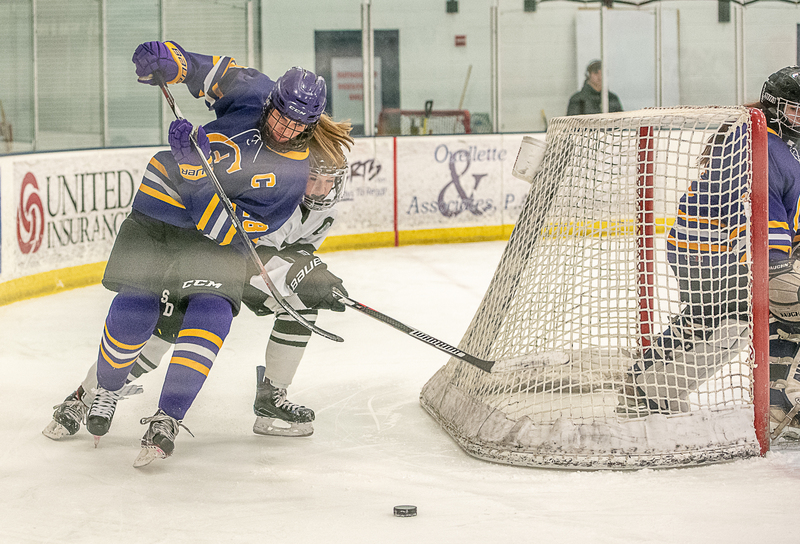 Hammerton scored the game-tying goal with 3.4 seconds left on a rebound and the Saints were able to secure a 2-2 draw in overtime at Norway Savings Bank Arena on Saturday. “It was awesome. Bugsy’s a fast, aggressive skater, and right place, right time, she popped one in, and it was great,” Saints coach Paul Gosselin said. The Saints (12-4-2) outshot the Stags (15-2-1) in the eight-minute extra period, 6-1, but neither team found the back of the net. “Trinity (Atwater) came up with some big saves when she needed to,” Stags coach Scott Rousseau said. Abby Lamontagne put the first shot of the game in the back of the net for the Stags more than five minutes into the contest. 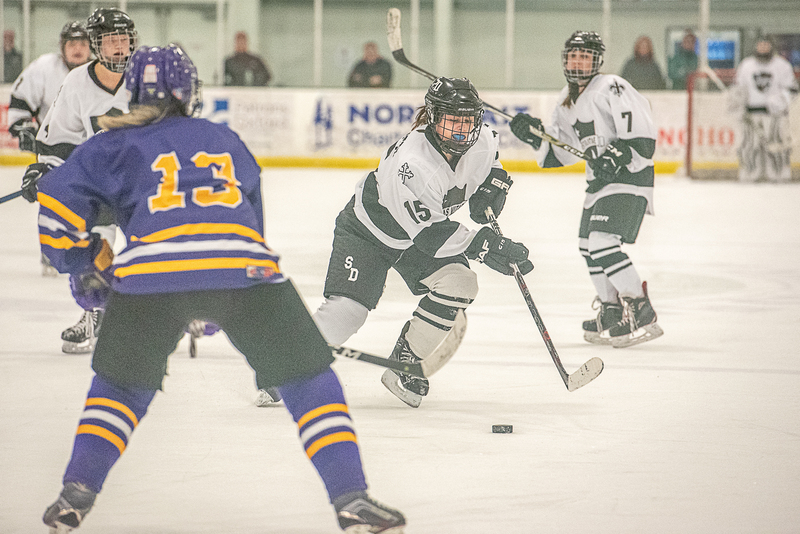 The speedy junior forward took control of a loose puck in the neutral zone and skated in to fire a shot past Saints goalie Madyson Boulet. It took a while for the Saints to answer, but they did on their second power play of the period. Atwater stopped Gigi Ouellette’s initial shot, but Hammerton put home the rebound. Emma Theriault picked up the secondary assist. The Saints went on two more power plays in the second, but Atwater and the Stags’ defense denied a combined three shot attempts. Boulet only faced three shots in the second, but they were all big ones. She stuffed Lamontagne just over four minutes in, then later denied Sophia Pompeo and made a rebound save as well. The sophomore goalie had to make 10 saves in the third, but couldn’t make an 11th against Lamontagne, who scored on an assist from Sophia Pompeo on another counter-attack shot. Gosselin called his timeout with 1:33 left in regulation, and he told his team to crash the net. Hammerton did just that to tie the game, after Atwater initially stopped Emma Roy’s shot. Avery Lutrzykowski had the secondary assist. Atwater stopped 21 of 23 shots, Boulet 16 of 18.